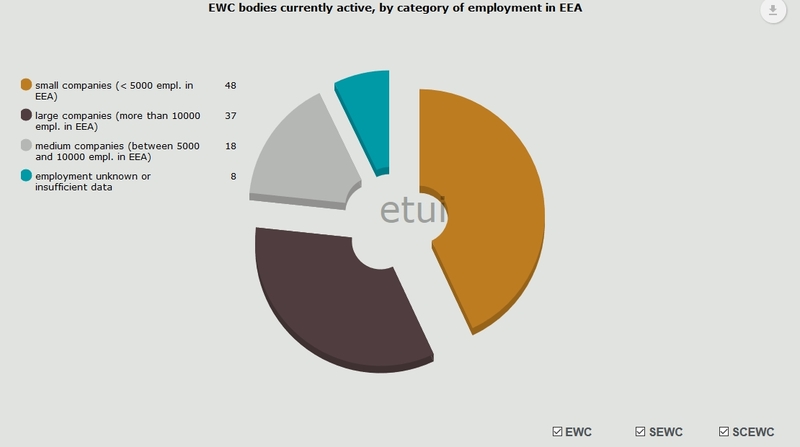 The graphs on this site were prepared on the basis of information gathered within the EWC Database (EWCDB) of the ETUI. Click on the pictures to enlarge! The slides can be downloaded from the EWCDB-Website in DE, EN, ES, FR, IT, NL and PL. After more than two decades of operation, the total number of transnational bodies for information and consultation (EWCs created) has reached 1529, while 1150 of them are curently (April 2018) active (operating). We have observed a steady, though moderate (and gradually declining) growth pace in the number of EWCs each year. The rate of the creation of such bodies was highest in 1996 (introduction of Directive 94/45/EC and deadline for voluntary EWC agreements) and in 1999–2000 (extension of Directive 94/45/EC to UK and Ireland). Since 2002, the annual number of newly created EWCs has been, on average, 30–35, with on average 20-25 new ones per year creted in the past 5 years. On the other hand, EWCs have also been terminated as a result of various processes: mergers between multinational companies (MNCs), acquisitions/takeovers or the bankruptcy of MNCs. For more and the most recent statistics on EWCs visit http://www.ewcdb.eu/stats-and-graphs. De Spiegelaere (2017) 'Too little, too late? Evaluating the European Works Councils Recast Directive', Report, ETUI. 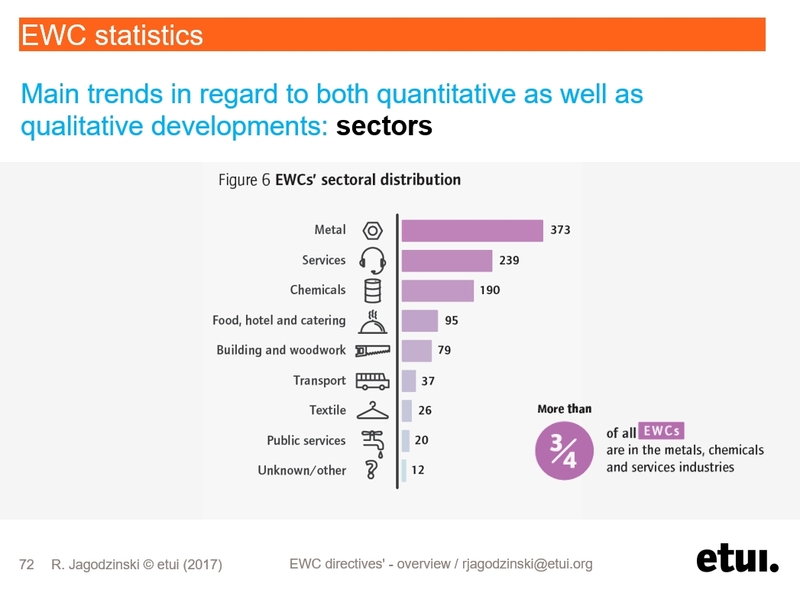 The population of EWCs is not spread equally across all sectors. The sectors with most EWCs are metals and chemicals and the service sector. These together represent more than three quarters of all active EWC bodies. In sectors such as textiles, transport and public services, the numbers of EWCs are significantly smaller and the number of newly created EWCs tends to increase slightly over time. Generally speaking, the reason for the variation in numbers of EWCs between sectors is their differing characteristics. Specifically, one of the main reasons for these significant sectoral differences in terms of EWCs is the presence of multinationals covered by the directive. An important factor is also whether companies in the given sector operate on sites with a high concentration in terms of employee numbers (thereby facilitating worker organisation), such as big factories or production facilities, or whether the workforce is spread out, as is the case in the transport or building industries. In some sectors, the prevalence of family companies, in which management-worker relationships have traditionally been non-institutionalised, represents another obstacle to an increasing proportion of EWCs. Similarly as in the case of sectors, we observe a high variation in numbers of EWCs depending on the country where the company in which they are set up has its headquarters. 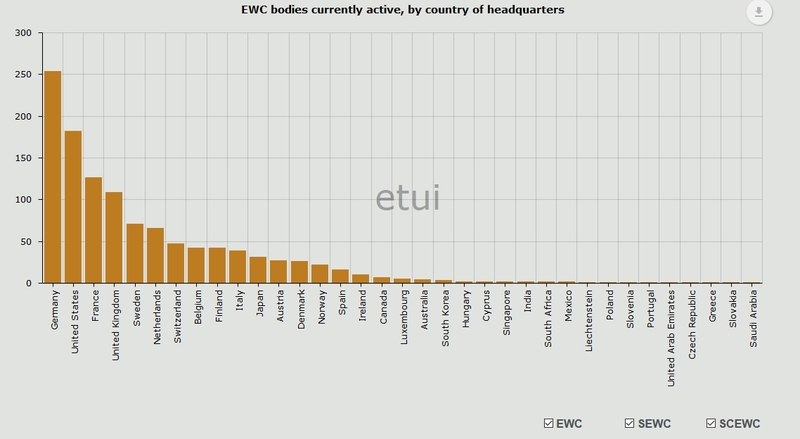 Looking at the headquarters of the companies having an EWC, we see that the vast majority of EWCs are active in companies having their headquarters in the ‘old’ member states. Germany is in the leader position, followed by France and the UK. What is more, EWCs are also frequently active in non-European multinationals having their headquarters in the US, Switzerland, Japan or Canada. (De Spiegelaere and Jagodzinski (2015) EWC Facts and Figures). It seems that national traditions and corporate culture (country of origin/headquarters of an MNC) do have an impact on the establishment of EWCs. The national distribution of EWCs by country of headquarters of the parent company shows significant variations between the EU member states. As can be seen in this figure, the highest number of currently active EWCs is found in German companies, followed by US-based multinational enterprises operating in Europe, and British, French and Swedish companies. EU directives are not directly applicable in EU member states. They have to be transposed and implemented through national legislation (see Jagodzinski (2015) Variations on a theme? Implementation of the EWC Recast directive). Every country therefore decides autonomously how to implement the EU regulations on European Works Councils. At the same time, the EWC regulation covers multinationals active in at least two member states, giving rise to the question of which rules these EWCs have to follow. Company size measured by number of employees seems consistently to play an important role in terms of defining initial conditions for the establishment of an EWC. The highest rate of existing EWCs was identified in the largest multinational enterprises, with over 10,000 employees (32% of the total), and in the smallest MNCs below 5,000 employees (35%; note that 'small' in this case is only used as a relative size description and does in no way correspond to the definition of small-medium enterprises). For companies between 5,000 and 10,000 employees the rate is only at 15%. An important factor shaping the distribution of EWCs is the degree of internationalisation of a company, i.e. the number of EU countries in which the company has activities. For a multinational to be covered by the EWC directives, it needs to employ over a thousand employees in total and at least 150 in two EU countries. A lot of the multinationals with an EWC are nevertheless far more internationalised than that; about 42% have activities in more than 10 member states, 30% in 5 to 10 member states, and only 18% in less than 5 member states. This completes the picture of a typical company with an EWC: a big company with more than 10 thousand employees across the EU, in metals, chemicals or the services sector, headquartered in Germany, France or the UK (or US or Japan) and highly internationalised (i.e. with operations in more than 10 member states). Source: De Spiegelaere and Jagodzinski (2015) EWC and SE works councils in 2015. Facts and Figures. 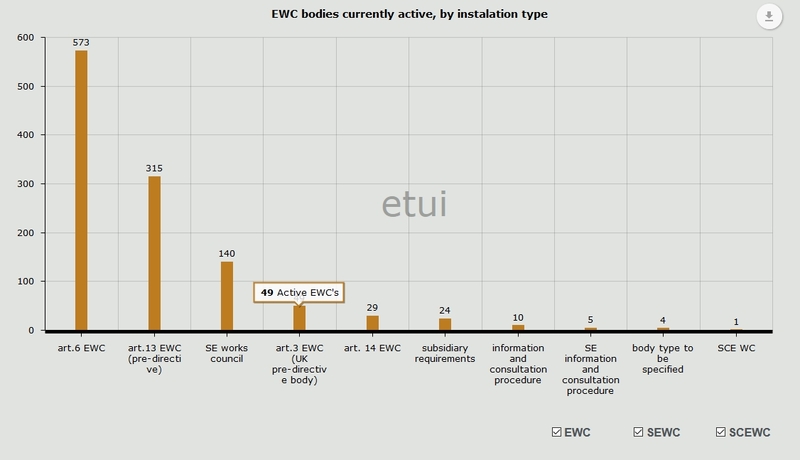 The ETUI’s EWC database classifies these bodies according to type of installation agreement. On this basis, we can estimate the distribution of specific types of EWC. Currently, the majority of active EWCs are bodies established according to art. 6 of Directive 94/45/EC. Arrangements for these bodies are required to meet the minimum requirements laid down in the Directive. Depending on the company, the date and the characteristics of the agreement founding an EWC, we can distinguish between different types of European Works Council. 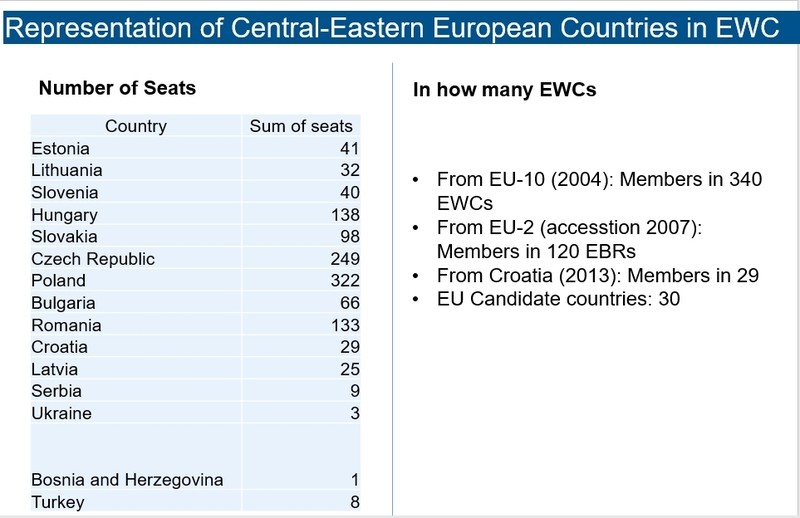 Most of the EWCs (49%) are the so-called Article 6 EWCs. These EWCs are fully regulated by the EWC Directive of 1994 and the 2009 Recast Directive. On the other hand, 39% of the existing EWCs are ‘pre-directive’ EWCs. Here, the first agreements were signed before 22 September 1996. These EWCs are not fully covered by the EU Directive of 1994 and its Recast of 2009. These EWCs were established voluntarily before 22/09/1996 (entry into force of Directive 94/45/EC or, for the UK and Ireland, before the entry into force of Directive 97/44/EC). The voluntarily established EWCs are not subject to minimum standards (subsidiarity requirements) of the EWC directives and retained this status also after the entry into force of the new, recast Directive 2009/38/EC. On the other hand, the works councils established in SEs currently represent a small, but steadily growing group (more information on employee representation in SEs can be found in the section ‘European Company’). Finally, there is a marginal group of EWCs established on the basis of an information and consultation procedure rather than as permanent bodies meeting on a regular basis.